"Primary resource" redirects here. For original sources used in research, see Primary source. 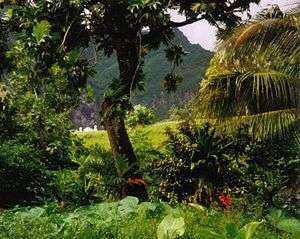 The rainforest in Fatu-Hiva, in the Marquesas Islands, is an example of an undisturbed natural resource. Forest provides timber for humans, food and shelter for the flora and fauna. The nutrient cycle between organisms form food chains and biodiversity of species. The ocean is an example of a natural resource. Ocean waves can be used to generate wave power which is a renewable energy. Ocean water is important for salt production, desalination, and providing habitat for deep water fishes. There are biodiversity of marine species in the sea where nutrient cycles are common. 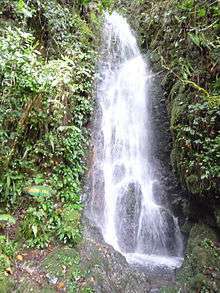 Particular areas such as the rainforest in Fatu-Hiva are often characterized by the biodiversity and geodiversity existent in their ecosystems. Natural resources may be further classified in different ways. Natural resources are materials and components (something that can be used) that can be found within the environment. Every man-made product is composed of natural resources (at its fundamental level). A natural resource may exist as a separate entity such as fresh water, and air, as well as a living organism such as a fish, or it may exist in an alternate form which must be processed to obtain the resource such as metal ores, petroleum, and most forms of energy. There is much debate worldwide over natural resource allocations, this is particularly true during periods of increasing scarcity and shortages (depletion and overconsumption of resources) but also because the exportation of natural resources is the basis for many economies (particularly for developed countries). Some natural resources such as sunlight and air can be found everywhere, and are known as ubiquitous resources. However, most resources only occur in small sporadic areas, and are referred to as localized resources. There are very few resources that are considered inexhaustible (will not run out in foreseeable future) – these are solar radiation, geothermal energy, and air (though access to clean air may not be). The vast majority of resources are theoretically exhaustible, which means they have a finite quantity and can be depleted if managed improperly. Abiotic – Abiotic resources are those that come from non-living, non-organic material. Examples of abiotic resources include land, fresh water, air and heavy metals including ores such as gold, iron, copper, silver, etc. Potential resources — Potential resources are those that exist in a region and may be used in the future. For example, petroleum occurs with sedimentary rocks in various regions, but until the time it is actually drilled out and put into use, it remains a potential resource. Actual resources — Actual resources are those that have been surveyed, their quantity and quality determined and are being used in present times. The development of an actual resource, such as wood processing depends upon the technology available and the cost involved. Reserve resources — The part of an actual resource which can be developed profitably in the future is called a reserve resource. Stock resources — Stock resources are those that have been surveyed but cannot be used by organisms due to lack of technology. For example: hydrogen. Renewable resources — Renewable resources can be replenished naturally. 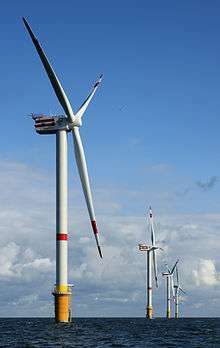 Some of these resources, like sunlight, air, wind, water, etc., are continuously available and their quantity is not noticeably affected by human consumption. Though many renewable resources do not have such a rapid recovery rate, these resources are susceptible to depletion by over-use. Resources from a human use perspective are classified as renewable only so long as the rate of replenishment/recovery exceeds that of the rate of consumption.And they can replenish easily compared to Non-renewable resources. Resource extraction involves any activity that withdraws resources from nature. This can range in scale from the traditional use of preindustrial societies, to global industry. Extractive industries are, along with agriculture, the basis of the primary sector of the economy. Extraction produces raw material which is then processed to add value. Examples of extractive industries are hunting, trapping, mining, oil and gas drilling, and forestry. Natural resources can add substantial amounts to a country's wealth, however a sudden inflow of money caused by a resource boom can create social problems including inflation harming other industries ("Dutch disease") and corruption, leading to inequality and underdevelopment, this is known as the "resource curse". Extractive industries represent a large growing activity in many less-developed countries but the wealth generated does not always lead to sustainable and inclusive growth. Extractive industry businesses often are assumed to be interested only in maximizing their short-term value, implying that less-developed countries are vulnerable to powerful corporations. Alternatively, host governments are often assumed to be only maximizing immediate revenue. Researchers argue there are areas of common interest where development goals and business cross. These present opportunities for international governmental agencies to engage with the private sector and host governments through revenue management and expenditure accountability, infrastructure development, employment creation, skills and enterprise development and impacts on children, especially girls and women. In recent years, the depletion of natural resources has become a major focus of governments and organizations such as the United Nations. This is evident in the UN's Agenda 21 Section Two, which outlines the necessary steps to be taken by countries to sustain their natural resources. The depletion of natural resources is considered to be a sustainable development issue. The term sustainable development has many interpretations, most notably the Brundtland Commission's 'to ensure that it meets the needs of the present without compromising the ability of future generations to meet their own needs', however in broad terms it is balancing the needs of the planet's people and species now and in the future. In regards to natural resources, depletion is of concern for sustainable development as it has the ability to degrade current environments and potential to impact the needs of future generations. At present, with it being the year of the forest, there is particular concern for rainforest regions which hold most of the Earth's biodiversity. According to Nelson deforestation and degradation affect 8.5% of the world's forests with 30% of the Earth's surface already cropped. If we consider that 80% of people rely on medicines obtained from plants and ¾ of the world's prescription medicines have ingredients taken from plants, loss of the world's rainforests could result in a loss of finding more potential life saving medicines. The depletion of natural resources is caused by 'direct drivers of change' such as Mining, petroleum extraction, fishing and forestry as well as 'indirect drivers of change' such as demography, economy, society, politics and technology. The current practice of Agriculture is another factor causing depletion of natural resources. For example, the depletion of nutrients in the soil due to excessive use of nitrogen and desertification. The depletion of natural resources is a continuing concern for society. This is seen in the cited quote given by Theodore Roosevelt, a well-known conservationist and former United States president, who was opposed to unregulated natural resource extraction. In 1982 the UN developed the World Charter for Nature, we have to protect it just like our mother, which recognized the need to protect nature from further depletion due to human activity. It states that measures need to be taken at all societal levels, from international to individual, to protect nature. It outlines the need for sustainable use of natural resources and suggests that the protection of resources should be incorporated into national and international systems of law. To look at the importance of protecting natural resources further, the World Ethic of Sustainability, developed by the IUCN, WWF and the UNEP in 1990, set out eight values for sustainability, including the need to protect natural resources from depletion. Since the development of these documents, many measures have been taken to protect natural resources including establishment of the scientific field and practice of conservation biology and habitat conservation, respectively. Natural resource management is a discipline in the management of natural resources such as land, water, soil, plants and animals, with a particular focus on how management affects the quality of life for both present and future generations.Hence sustainable development can be followed where there is a judicial use of resources which compromises the needs of the present generations as well as the future generations. A successful management of natural resources should engage the community because of the nature of the shared resources the individuals who are affected by the rules can participate in setting or changing them. The users have rights to devise their own management institutions and plans under the recognition by the government. The right to resources includes land, water, fisheries and pastoral rights. The users or parties accountable to the users have to actively monitor and ensure the utilisation of the resource compliance with the rules and to impose penalty on those peoples who violates the rules. These conflicts are resolved in a quick and low cost manner by the local institution according to the seriousness and context of the offence. The global science-based platform to discuss natural resources management is the World Resources Forum, based in Switzerland. ↑ "Earth's natural wealth: an audit". Science.org.au. May 23, 2007. ↑ "Peak Everything?". Reason.com. April 27, 2010. ↑ "EnviroStats: Canada's natural resource wealth at a glance". Statcan.gc.ca. Retrieved 2014-05-31. 1 2 3 "UN 2002 Earth Summit Agenda 21 The United Nations programme for action from Rio: Section Two – Conservation and Management of Resources for Development, United Nations, Rio". Un.org. 12 September 2011. ↑ "UN 1987 'Report of the World Commission on Environment and Development: Our Common Future' UN Documents: Gathering a body of global agreements". Un.org. 12 September 2011. ↑ UNESCO and UNEP 2002 Cultural Diversity and Biodiversity for Sustainable Development, World Summit on Sustainable Development, Johannesburg. 1 2 "UNEP 2011 International Year of Forests". Un.org. 12 September 2011. 1 2 3 4 "Nelson 2005 Chapter 3: Drivers of Ecosystem Change: Summary Chapter in Current State and Trends Assessment Millenium Ecosystem Assessment" (PDF). 12 September 2011. ↑ "UN 1982 General Assembly World Charter for Nature: 48th Plenary meeting". United Nations. 13 September 2011. ↑ Fein, J. (2003). "Learning to Care: Education and Compassion", Australian Journal of Environmental Education 19: 1–13. Available: http://www.griffith.edu.au/__data/assets/pdf_file/0018/314613/fien03.pdf. Accessed: May 31, 2014. ↑ Soule, Michael E. (1986). Conservation Biology: The Science of Scarcity and Diversity. Sinauer Associates. p. 584. ISBN 0-87893-795-1. ↑ Habitat Conservation Planning Branch. "Habitat Conservation". California Department of Fish & Game. Retrieved 2009-04-07. 1 2 3 "Ostrom E cited in Kommers N and Mackie P 2005 Journalist guide to world resources 2005 World Resources Institute 1-30" (PDF). Pdf.wri.org. 1 2 3 "UNDP,UNEP, The World Bank and World Resources Institute – The Wealth of the Poor: Managing Ecosystems to Fight Poverty Institute 2005 Chapter 3 The board's role in governance, World Resources 2005" (PDF). Sc.com.my. Wikimedia Commons has media related to Natural resources. Batey Blackman, Sue Anne; Baumol, William J. (2008). "Natural Resources". In David R. Henderson (ed.). Concise Encyclopedia of Economics (2nd ed.). Indianapolis: Library of Economics and Liberty. ISBN 978-0865976658. OCLC 237794267.